Proof of immunity to Hepatitis B – Medical documentation is required showing that you have received at least two hepatitis B injections or a blood test showing proof of immunity. Medical Forms – The Aardvark medical forms may be submitted to MADA. However, please note that they must be filled out by a physician who has known and treated you for at least three years. 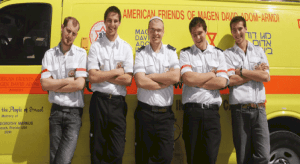 If you have ever seen a psychiatrist, psychologist or social worker a letter will be required from the treating mental health provider stating that you are capable of participating in the MADA program, which includes finishing a difficult course and working under intense psychological and sometimes physical stress as an EMT. If you have ever undergone an operation or if you have or have had any chronic diseases, a letter is required from your physician stating that you are capable of volunteering for MADA (see above clause). If you are taking any prescription drugs, a letter is required from your physician stating why you are currently taking this drug and that you are capable of volunteering for MDA (see above clause). 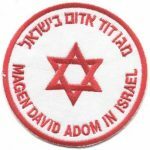 Please note: Acceptance to the MADA course requires a Hebrew evaluation. If the Hebrew level of the participant is not sufficient, they will not be accepted.